The government of Viet Nam has made a commitment to build a Learning Society by 2020 as a part of ASEAN countries’ lifelong learning ambition. A range of related initiatives have been launched by Viet Nam government to encourage reading and raising awareness of its importance for sustainable development of knowledge and skills. Viet Nam aims to implement and develop lifelong learning activities in out-of-school education institutions such as libraries, museums, Community Learning Centres (CLCs) and cultural center clubs to achieve this national and regional goal. The government of Viet Nam currently operates more than 23,000 state funded libraries and 11,900 CLCs throughout the country and is in the process of both renovating and innovating public libraries, CLCs and museums. In addition to the work undertaken by the Viet Nam government, a number of enterprises have also been initiated by non-government and non-profit organisations to promote literacy and lifelong learning using libraries. 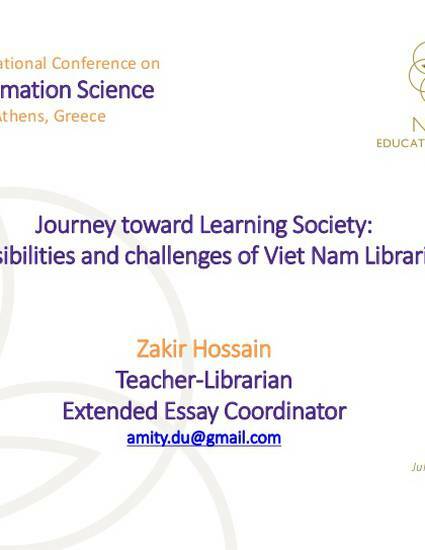 As the concern authority believes that libraries can be a potential catalyst for Learning Society project, it is also essential to measure the possibilities and challenges of Viet Nam libraries. This analytical study, therefore, investigates some government and non-governmental initiatives focused on libraries, their impact on reading promotion and lifelong learning, and challenges they face. Proposing a way forward, the paper confirms that Viet Nam’s libraries play an essential role in promoting reading and building a Learning Society in Viet Nam.